VR is currently the in technology with the HTC Vive, Oculus and the PlayStation VR taking a lot of interest of many different types of gamers. More companies are getting involved with the likes of Samsung and even Nokia at one stage. 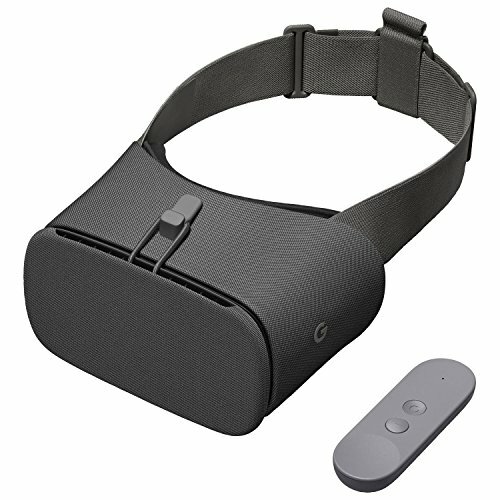 Google first released the Daydream View headset at the end of 2016 but have recently updated their View with a 2017 edition that goes well with the recently released Google Pixel 2 and Google Pixel 2 XL. What is the Google Daydream? Put simply, it’s Google’s slice of VR pie and works with their mobile platform OS, Android. Put on the headset with a phone that supports it and you’ll be greeted in a forest with a screen that allows you to interact with a range of different apps and media content. You can look around 360 degrees but it will not track your position in the room like the HTC Vive and Oculus VR platforms. Within the Daydream environment, you can access the Google Play Store meaning you can install additional games, apps and content directly within the VR Space. Some services include YouTube VR and Netflix VR which allow you to watch shows on a massive 100-inch screen in a simulated house. The platform has been able to grow quite a bit since its release in 2016, with hundreds of videos you can watch and a fair amount of games you can play. The problem with all VR though is the overall lack of games as a whole which stops you from coming back for something new or a little bit different from all the other “shooters” out there. There are a lot of free games through which helps you get stuck in and new users to the Daydream View 2017 edition will give you 5 free paid games for free, including the magical combat game Wands. In terms of tech, the Daydream View itself is not the main player, it acts more like a holder for your phone and comes with a controller that allows you to interact with the VR content and games. In terms of design, it looks really nice and has the same running effect on the Google Home Mini and the Pixel 2 and XL official cases with the grey fabric effect. The 2017 model is not massively different from the previous 2016 model but is very very comfortable. We tried the 2016 model a while back and that was nice but this is on a new level of comfort. Everything with the device is sturdier and fits your head really well while not making it feel constrained. Although it does have a lot of fabric, the View 2017 is very breathable not making your head feel sweaty or too hot after using it for some time. It looks smart and has a good fit with an additional removable strap that goes over your head and will support those that wear glasses. There are some changes to the design such as not being able to store the controller inside the Daydream itself. Instead, you’ll need to put the controller in the loop of the headset but seen as you probably won’t be moving the headset about too much it will be pretty unnecessary. The flap does work wonders in the new model to control the heat from the phone acting as a heatsink, the older model had an issue with keeping in all the heat. Now you should not experience any slowdown or issues due to overheating, which if your using a slightly older device could be an issue. After playing the demo, a few games and watching an hour programme on Netflix there was not major heat inclusion within the headset or the phone. It, of course, did get warm but nothing out of the ordinary playing a game outside of the Daydream VR headset. The previous Daydream had a lack of support for phones which mainly were the original Pixel and Pixel XL. The new model, however, supports the new Pixel 2 and Pixel 2 XL but also phones such as the Samsung Galaxy Note 8 and the Galaxy S8, Moto Z Force, Asus Zenfone AR plus many more. It still does not support iOS devices but to be honest, I don’t think it ever will and Apple is likely to have their own in the future. The main support needed for the device is Bluetooth 4.2 LE, a screen size between 4.7 and 6 inches with at least a 1080p resolution. It also needs 3ms or less latency and less than 5m persistence at 60Hz. This is due to the fact that it needs to decode two instances of 60Hz video at the same time. The main requirement is that need for an OLED panel, that means anything using the cheaper IPS screens won’t work. There’s also much better fit for the displays which means there is less light leakage from the outside which can create a glare and affect your experience in VR. There’s also 10 more degrees of view for the devices, that allows you to see that little bit more. The controller has had a subtle update from the previous one, making it a little sleeker. It’s a very capable device with gyroscopes inside so you can move it in any direction being able to pick it up in the virtual world. There is nothing added or new to the Daydream 2017 controller but it is easy to use, light and the buttons are raised and lowered to be used without having to look at the controller. Games, games, games and some video. Like most VR platforms the one problem that plagues them is the ability to keep gamers coming back for more content. Google’s VR headset has the same issues and it is largely down to their back catalogue of titles. There are a few standout games in the app store for VR but a lot of them as expected feel like a mobile title. Games like Wands, Lego Brickheadz VR and Eclipse: Edge of Light are some of the best VR titles among a lot of on the rail type experiences like roller coasters, under the sea and other environmental apps. These hold your attention for a little while but there is little substance in them to make you want to come back time and time again. Really, there needs to be more like Wands and Eclipse with some games trying to do something a little different. The Daydream View usually has some decent power to work with, so pushing for something a bit more than a standing shooter, or walk me through a jungle is not too hard to ask? It is cool though that you can cast your VR headset to your TV so that others can see what you see, it’s always hard to describe a VR experience so this helps bring it to the wider room. Luckily, there are plenty of games to get you started and more than the first version of the headset and should be enough to keep you occupied. Google Daydream Price – How much does the Daydream 2017 Cost? The new Daydream View is a little bit more expensive than the previous model, now costing £99 and remember you will also need a phone that works for it. You can choose one of three colours, the standard grey, black or coral which follow the same colour scheme as their Home Mini. Like their other devices their warranty with cover the View 2017 for up to one year from usual manufacturing defects. When you do buy your Daydream View, there’s an offer that will provide you with a selection of games to get you started. Google's second iteration of VR headset the Daydream View 2017, is a decent Virtual Reality headset for your mobile device if you have a compatible phone.